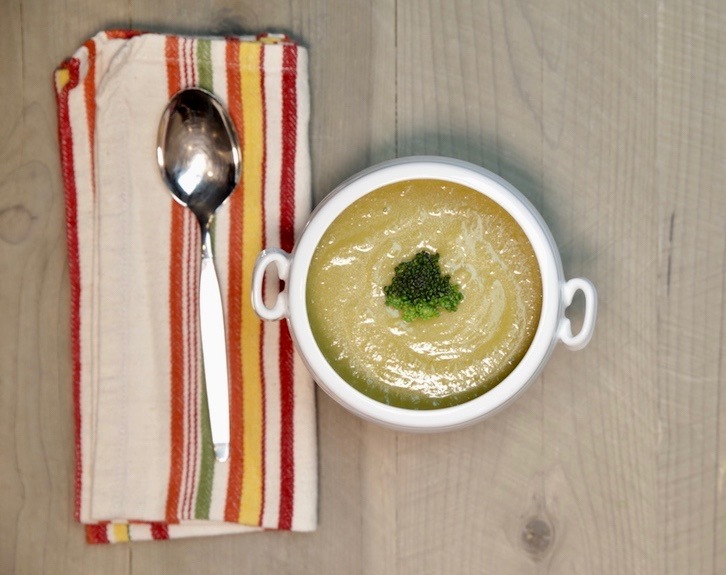 Broccoli Cheddar Soup is made with a roux: flour, butter and milk as a thickener. I often find that too much roux is used and the soup is pasty. So unappealing. Another problem these days is finding broccoli with full stalks. Stores are cutting them off and repurposing them for their deli or salad bar with broccoli slaws. This is a problem for me, because I only use stalks in my soup. I don’t care for the texture of the florets in the soup. Broccoli stalks can be a tad woody and it’s important to trim the ends and pare the outer layer to remove the tough skin. The recipe calls for a minimal amount of salt. Saltiness of cheese and stock varies and it’s best to have all the ingredients incorporated first and then adjust the salt at the end. This broccoli Cheddar soup has a silky texture and delicate flavor. It freezes well, so make up a batch or two for future use. I like to use two-cup Mason jars; the perfect serving for one. NOTE: I have since made the soup again and with the difficulty these days of finding whole broccoli I used the florets as well. Purée until completely smooth. Watch the Broccoli Cheddar Soup Video Here. This broccoli Cheddar soup is super delicious, has a silky texture that hits the spot on any day. Use extra-sharp cheddar for best flavor! Place broccoli, onion, celery, garlic, salt and stock/water in a large saucepan. 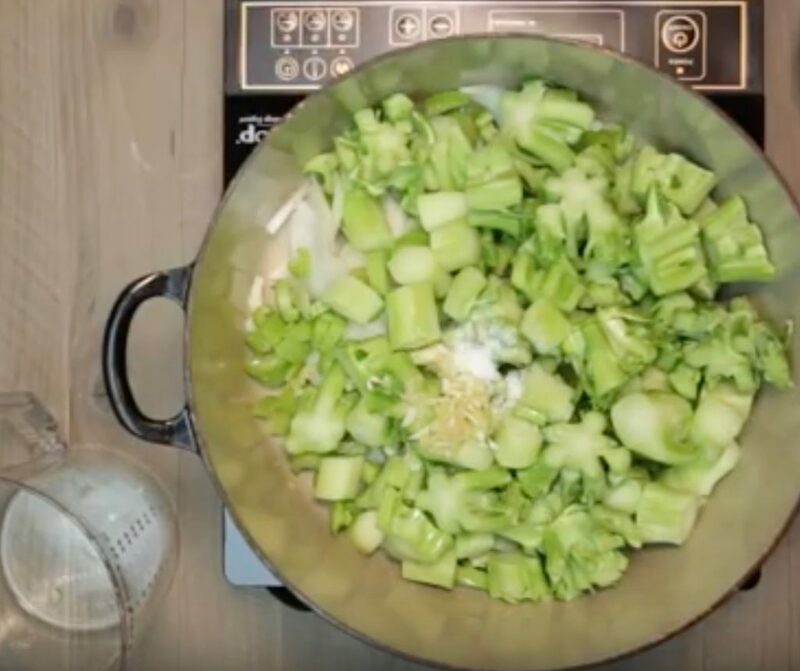 Bring to a boil, lower the heat to a gentle boil and cook for 40 minutes or until the broccoli is very soft, timing varies depending on the size of the pieces. Purée the soups in batches in a blender or food processor or in the saucepan with an immersion blender until smooth. Do this in batches and fill the container halfway with a mix of solids and liquid. Pour the puéed soup into another pourable container and wipe out the saucepan. Melt the butter in the saucepan over medium heat. Sprinkle the flour over the butter and whisk until smooth. Slowly pour in the warm soup, whisking constantly to prevent lumps. Bring to a gentle simmer and cook another 2-3 minutes to eliminate the raw flour taste. Shake in the hot sauce to taste; this gives the soup a boost, it doesn’t necessarily need to be spicy hot, but the sauce gives the soup piquancy.